Other Family Data Children: Rosie Donnenberg Weill (4B4), Samuel Dunn (4B5) and Pauline Donnenberg Komor. Sister-in-law: Elyse Lyons (2E14). Sons-in-laws: Albert Weill (4B7) and Siegfried Komor (4E2). Grandchildren: Sophie Rachel Odell (4B2) and Leon “Leo” Weill (4B6). Great-grandson: Victor Jack Cario (4B9). He went to Japan in 1888 and, in partnership with J. Bercovich, who had lived and operated a saloon in Japan for some years, he established Bercovich & Donnenberg, proprietors of the Hotel Europe, Yokohama # 41. In 1889, his wife and daughter Pauline joined him. They operated the hotel until 1890. It was sold to A. Goldman in 1891 and they left Japan for Hong Kong. According to the Carl Smith archives, he took charge of the Globe Hotel on Queen’s Road Central in 1891. Three years later he transferred it to Isydor Silberman, the father of the Sarah Silberman (1H8) and the unnamed child buried in 1H4. 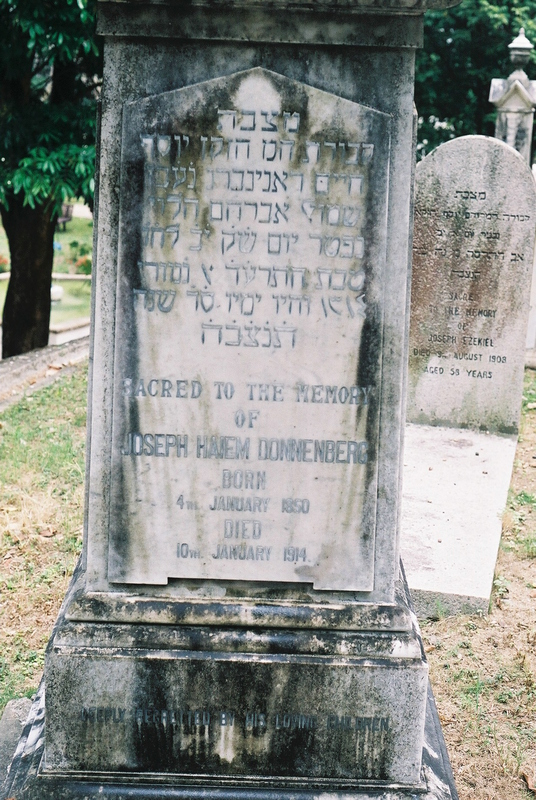 In 1897, he became the proprietor of the Colonial Hotel on Jubilee Street, which was previously licensed to Moritz Sternberg, the father Jacob Sternberg (1H7). In 1901, the license was transferred to Annetta Papier, the wife of Pinchas Moses Papier (1G3) and mother of Emily Papier (1D1).